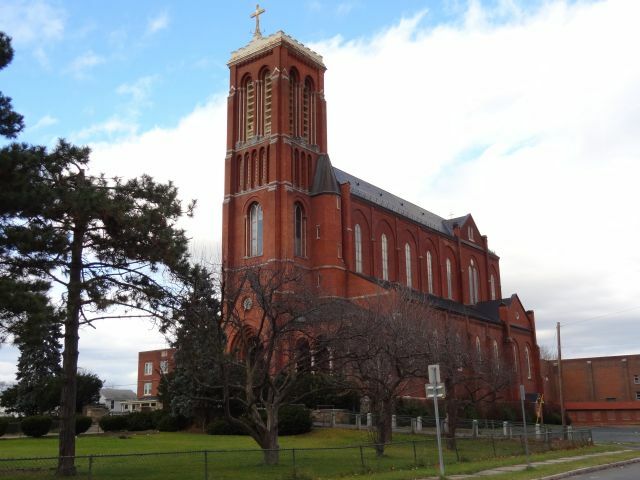 St. Patrick's Roman Catholicchurch was established in 1840 in the village of West Troy, now the city of Watervliet, NY. It served a predominately Irish immigrant population. The original St. Patrick's was a brick building at the corner of Union and Burlington streets (presently, Twenty-third Street and Fourth avenue). Despite the establishment of another parish in the southern section of the community in 1855, the congregation's continued growth necessitated the construction of a larger worship site. Fr. Sheehan had traveled to Europe in 1879 and while there became entranced by the recently completed Basilica of the Immaculate Conception or, “Upper Basilica”, at Lourdes, France. It was designed in the neo-Gothic style and constructed between 1866 and 1872. Working with Troy architect Edward W. Loth, the new St. Patrick's church was a replica of that basilica. The cornerstone of the new 1800 seat building was laid on July 4, 1889. The first mass was celebrated Christmas day, 1891. Originally intended to be built of dressed stone, as was the Lourdes basilica, a stonemason's strike imperiled timely construction and a decision was then made to construct St. Patrick's with a brick facade. 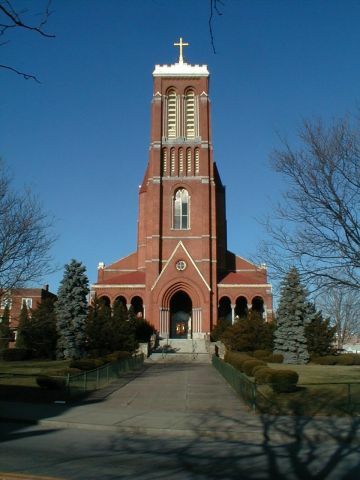 The bell tower, which is 137 feet tall, was intended to feature a spire, but that phase of construction was not completed. A huge bell, weighing 7500 lbs (nearly 10, 000 lbs mounted) and cast by Meneely & Company of Watervliet was installed. It was first rung on Easter Sunday, 1907. The church has an unusual feature, a loggia (an external covered porch) instead of a vestibule, something rarely seen in American church architecture. The interior of the church, with a 60 foot high nave, features 56 stained glass windows, installed at various times between 1891 and 1948. They include windows by the noted firms Mayer of Munich and James Powell & Sons, Whitefriars, London. The fourteen large stations of the cross are mounted on altars of oak along both nave aisles. The column bases of the nave arcade were constructed of rough granite, with the intention of allowing memorials to be created by carving donors' names upon them. The soaring main altar is of white marble carved with a relief of the Last Supper. More than its individual architectural features, St. Patrick's is most notable for how it asserts its presence. As the Troy Record once noted, “There is no other church in the United States like it. 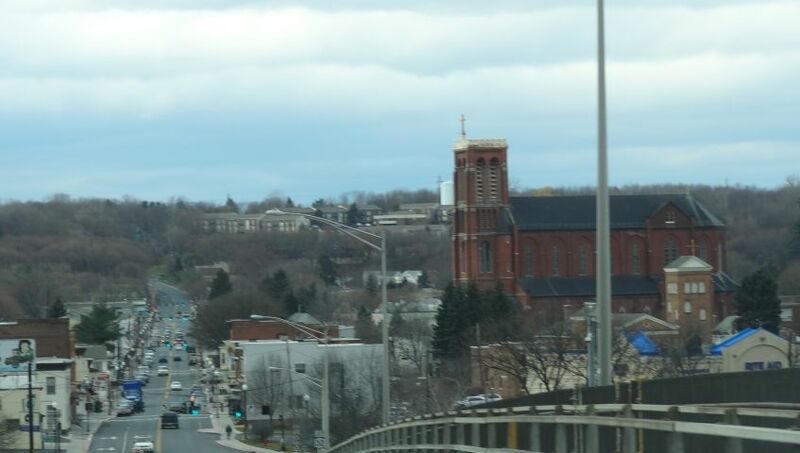 St. Patrick's church can be seen for many miles about and the attention of most strangers is attracted by its height.” Set well back from the adjacent streets and without competition from any other tall structures, the building absolutely dominates one's view as Watervliet is approached from any direction. Despite local efforts to save St. Patrick's Church from being demolished, this beautiful Church fell to the wreckers ball in April and May, 2013. 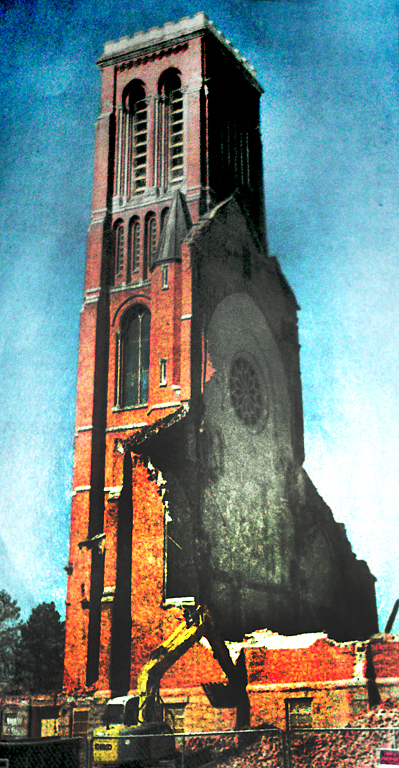 The bell tower, the last standing section of the Church, required bringing in larger cranes before it too was reduced to a pile of rubble. The following Memorial Names that were found in the church were transcribed by TIGS volunteers Stanton M. Broderick and Michael McAlonie. Broderick also provided the above history of St. Patrick’s Church. 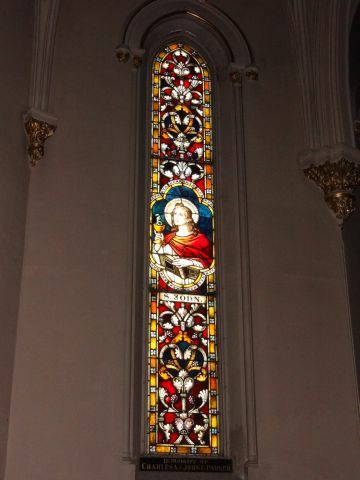 for providing detailed information on the wonderful stained glass of this church. Bertrand, Jules, J., Mr. & Mrs.
Bell, Cast by Meneely Bell Founders, Watervliet (West Troy), N.Y. - Key of B-flat (international pitch, base clef). Weight: 7500 lbs, 10,000 lbs with mountings. 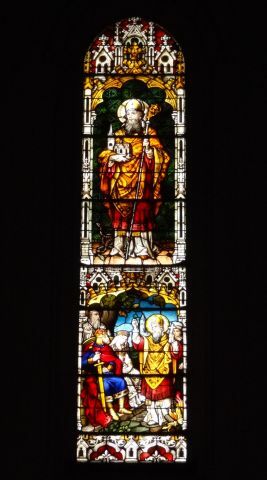 St. Patrick - In Nomine Jesu Genu Flectatur Coelestium - Terrestrium et Infernorum - Presented to St. Patrick's Church, West Troy, Watervliet, N.Y. By the Holy Name Society. George E. Hipwood, Prest. - Joseph T. Cavanaugh & Francis Powers, Secretaries - Thomas F. McLoughlin, Treas. - Rev. W. F. Sheehan, M. R., Pastor (English Translation: "In the Name of Jesus the Knee Should Bow, of Things on Earth and of the Underworld". Clemente, Frank, Mr. & Mrs.
Cole, Martin, Mr. & Mrs.
Conroy, William H., Mr. & Mrs.
Corey, Paul, Mr. & Mrs.
Cote, Stanley, Mr. & Mrs.
English, Frederick, Mr. & Mrs.
Marble Main Altar - Relief of Last Supper - Bronze Plaque Affixed at Rear. Front Center - Plaque missing, inscription from a recollection. Hogan, Donald P., Mr. & Mrs.
Hogarty, Daniel J., Jr., Mr. & Mrs.
Houlihan, James, Mr. & Mrs.
Hubbard, Edward J., Most Rev. 1890 Organ made by Geo. Jardine & Sons - 3 manuals, 32 stops, 34 ranks. Rebuilt of an instrument dated between 1850 and 1865. Now moved to St. Edward the Confessor Church in Clifton Park, NY. Kennedy, James, Mr. & Mrs.
Leahy, William Funeral Home, Inc. In Eternal Remembrance of Those From This Parish Who Gave Their Lives in World War II Lieutenant Peter H. Pryor, Jr.